When it comes to web design most business owners have no idea what goes into building an effective website. And why should you? You’ve got a hundred other things competing for your attention. Truth be told, anyone can build a website, and get you a presence, but if I know you, you’re looking for customers and revenue not merely a presence on the web. I paid a designer six months ago, but still don’t have a site. Will that happen if I go with you? My 16-year-old nephew said he’d build a site for me – why shouldn’t I go that route? Why shouldn’t we just use one of those free DIY template sites? It’s true – how much a website costs can range from DIY (hours of your time) to thousands of dollars. However, price is a terrible indicator of how effective your website will be at bringing you business. It’s even tougher for most business owners because you have no idea how to evaluate what makes a website convert. (Hint: It’s not pretty pictures, sliders and fonts). To the untrained eye, you probably can’t tell the difference between a website that never makes a sale and one that makes sales all day long unless you’ve seen or experienced it before. Often your website is intangible, the value or importance of it is only realised once you see how much money it can generate you. Things like the persuasive copy, analytics, search optimisation are critical elements of high performing websites and all work together with design to make your website profitable but they are most frequently the elements of websites that are ignored. Unfortunately, too many businesses focus on getting the lowest price point, which usually ends up costing them thousands of dollars in lost sales and website redo’s to fix the mistakes. This realisation normally occurs when you start spending money, marketing your site, without seeing any returns. Sure, pricing is important. After all, you are a business. Yet, most important is that you have the right goal in mind (i.e. leads and sales) and then you invest an appropriate amount to deliver the results you’re seeking. I’m of the school that a website that never converts is always an expense, no matter how little (or how much) you paid for it. Instead of focusing on the lowest price, let’s consider what can happen if your website becomes a high-performing asset. Yes, website strategy can impact your business in a big way. Imagine if your website doubled or tripled your conversions. What if it increased them by 10x? How would that impact your bottom line? If you’re like a lot of business owners, you’d love to see that type of impact. For many businesses, if you’re already receiving traffic then ask yourself – “How much money am I leaving on the table?”. I’ve worked with some customers to turn conversion rates from 3 – 8% overnight, simply by focusing on the critical elements that turn clicks into customers. There’s no doubt that once you recognise the value of a profitable website, you’ll also see how your website can be an investment and not an expense. However, there’s a challenge here – while plenty of people will tell you they can build a high-performing website, your ROI depends on your ongoing strategy and the experience of those you work with. Even if you get the design right, you’ll still need to put money into marketing it, with PPC/SEO or something different altogether, but if you don’t get the design right then there’s no doubt you’ll leave a tonne of money on the table. As with anything, you get the quality you dish out for – professionals come with hard-won skills and knowledge, and they charge accordingly. When you break it down, building a performance website takes a lot of time. There’s time spent reviewing your target customer and what they want, identifying your unique benefits and what separates you from competitors, optimising for searches with buying intent, dozens of hours in custom development, and time spent considering and testing out how your potential customer will use your new site. These days, it would be stupid to simply pay for a website, just so you can have something to put on a business card but that’s what many businesses are doing. You need a website that will bring you sales (and not just look pretty), isn’t this what 99% of all businesses want? When I build a website, I’m more concerned with the outcome of your website – its sales potential and whether it can attract customers organically. To do so it needs to be a highly functioning website that attracts your target market and converts them into customers, while looking aesthetically on-point and making you stand out from the competition. Many web agencies will charge a fixed cost for your site. This is based on past experience and an idea of the number of hours it will take to build based on your requirements. Most web professionals, from Graphic Designers to Web Developers, will charge within the $50-$250 per hour range. Sure, you could work with an overseas company (for example, India), and pay much less – maybe the equivalent to $25/hour or less – but there are major (read: not worth it) risks with this. Communication is often difficult, and assuring that you get all the components of a high-performing website is next-to-impossible. It’s not to say that overseas development is not possible, it is, but what you need to understand is that either you, or someone in charge, needs to have a very clear picture on what you need so you can manage the outcome and overall quality of the project. We recommend you work with local, experienced professionals with proven results and referrals. That way, you’re most likely to get the best results. When I first started in the web design game I was designing and building everything myself. While I like to think I have a fairly keen eye for design, I’m by no means a designer. In fact, the same can be said for most in the web design game. 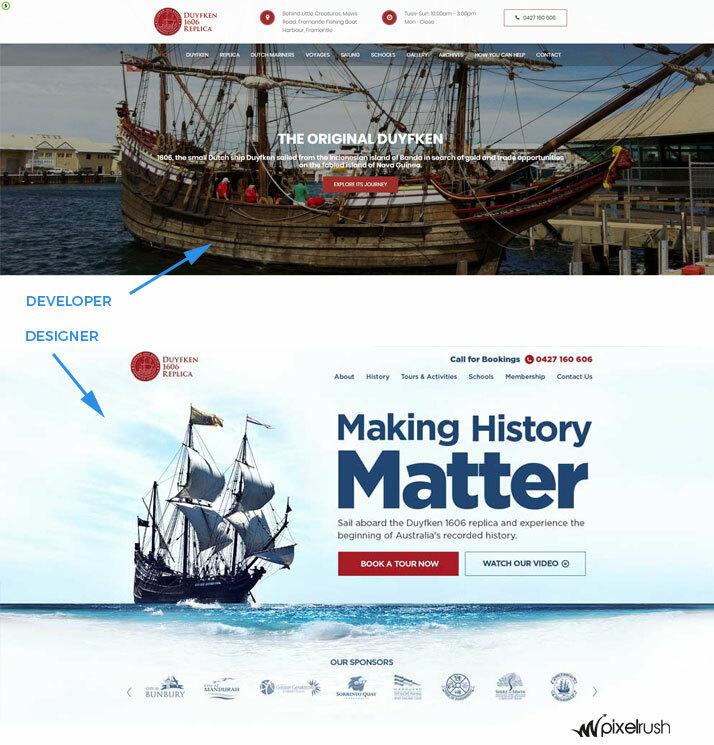 You see most developers are great with code and functionality but they have very little understanding about design, the difference to your finished website can be huge. Trying to develop a site before you’ve designed it is like building a house without first approving the layout (hint: you’ll end up with your en-suite attached to the lounge-room). A good designer should understand how their design plays a pivotal role in the psychology behind influencing more visitors to take action (i.e what makes visitors convert). They also understand how to create strong user experiences and make your content and key benefits stand out quickly in an age where attention is a commodity. The best way I can really show the difference between a designer and a developer is to highlight a recent project which I was a part of, the customer wanted to trial multiple agencies before they committed to the full project (hint: ours is second one). When you work with agencies who use proven designers, before developing, then you’ll also understand why you’re paying more. If you’re a small business owner in Australia, you can expect to pay anywhere from $2000-$12000+ for a website, depending on its size and complexity. It’s important that you understand what you get for this type of spend. Cheap websites come from inexperienced people. For example, your local teenager may be happy to slap together a website for you for under $500. We’ve even seen some agencies offering website prices that low. With this course of action, you’ll get a website (in most cases) but it won’t include any of the fundamentals of a website that converts – no strategy for sales, no SEO, no professional web copy that speaks to your target customers. It will just dissolve into the archives of the Internet, ignored and wasted. Sure, you can “add” conversion features later, but that will actually cost you more money. It’s like “adding” a kitchen upgrade after the rest of the house is finished, and realizing you want to move walls and appliances. There are things (like SEO ) that an experienced web design company will include from the beginning, so that you can (1) see the results right sooner, and (2) avoid wasting your money and needing a re-do. What Investment Do You Need to Make? Too many business owners think they can maximise returns but with a minimum investment. However if you’re running a business with the right mindset, you’ll recognize that a website created by an experienced web development team is a smart investment. One that can pay off in very tangible ways. Consider a small (5-8 page) custom designed website that costs $6000 to build, just as an example. Let’s also say that on average your customer is worth $1500 dollars to your business and you take 50% margins, you only need 8 customers for a website of this cost to break even. If you get 8 customers per month for twelve months from it that’s $72,000 dollars in additional annual profits. 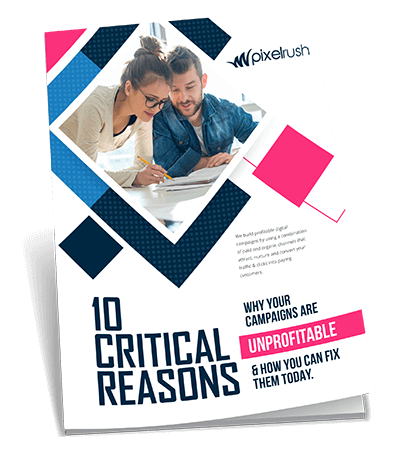 It’s ironic that most business owners will spend thousands of dollars per month on SEO and PPC while ignoring the design process, your website will potentially have the greatest impact on your future conversion rate and campaign ROI. “How do you design your websites?” – If they talk about cookie cutter themes and immediate development rather than distinguishing your business from it’s competitors and using designers to produce a custom look and feel then you’ll begin to see the difference in what you’re paying for. “Do you have examples of your work?” – A good designer will be able to show you a portfolio of their designs so that you can begin to understand the level of quality they can produce. “What do you recommend to improve conversion rate?” – A good development agency will be able to talk about call to actions, trust indicators, professional photos, above the fold and other key areas of your site that have the biggest impact on conversions. Don’t be swayed by fancy swagger or proposals – ask better questions, and you’ll get better results. Please don’t get me wrong, I’m not saying expensive is better, I’ve seen plenty of expensive websites provide little returns, but what you need to understand is that performance websites will be charged for accordingly. Our site is nowhere to be found in google. Too many websites just serve as a “www” to put on your business card, and I hope you realize by now that your website can be so much more. The success of your website is directly proportional to the web marketing knowledge you put into it. To maximize your return potential, you need to hire a web designer who understands conversions and SEO, with proven experience and referrals, and they’ll likely charge $75-$200 an hour. If you’re tired of the stress of an under-performing website and you’re ready to generate more leads online, then get in touch with me today. I’ll happily provide you with a personalised video review of your website and highlight the exact methods I’ll use to bring you results. No hard selling – just a real view of where your website is costing you money. Brilliant article. Very well written, very informative. I got a lot of useful information I will be implementing. Thanks Ben. Happy to Help and glad you took something away from it.